Revolver Rani is a film where the film dies but the character lives on. 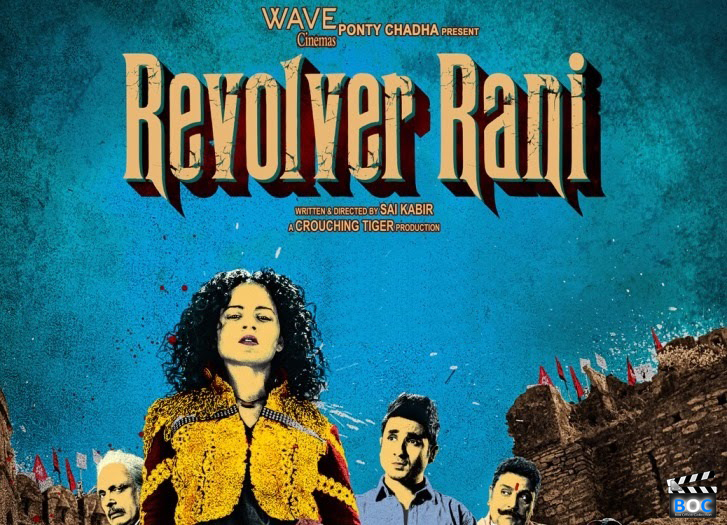 Sai Kabir’s directorial debut and Tigmanshu Dhulia’s production Revolver rani is such a venture of undying spirit of Revolver Rani played by Kangana Ranaut. She is as aggressive as vulnerable. Alka Singh who has been reining Chambal for quite a long time loses election to Uday Singh, who has been involved in corrupt practises to rise. The only agenda left behind for Alka is to expose Uday Singh. While she is successful in doing that comes in the love angle. She falls for Vir Das and her priorities change. The opponents being a good enemy seek the chance and hit Kangana so hard that she would do anything to save her love. Revolver Rani was supposed to be a masala movie intended with a dark humor on politics. Critics loved the masala but disliked the dark humor. And so did our audience. Thumbs up, for Kangana’s comedy timing! In Queen, we have seen her in a tragedy role. No one expected her to have that knack of comedy. In the movie we could see her saying ‘Hume nahi jaana jail mein, Chamcham (her boyfriend played by Vir Das) aaya hua hai or Hum kahin nahi jaa rahe hai, murga pel liya hai, neend aa rahi hai’, which amazes us. Just in the split of a second, seriousness converted to dark humour. It is not the first time that we could see Bollywood actress stepping into the male shoes. Her stunts deserve a toast. Although the start is stretched to a great extent that leaves you yawing, the movie has been applauded by the viewers. Let us have a look at the collection so far. Revolver Rani Friday collection – 1.90 Crores- movie on its opening day could see moderate to high occupancies all over India. Kangana’s acting was praised. Revolver Rani Saturday collection – 2 Crores- second day came in with more crowd. People liked the movie and quite a moderate earning was reported on this day. Revolver Rani Sunday collection – 2.1 Crores– the fame is rising and the theatres burning in with audience. Rising popularity of the movie is expected, as the graph is increasing gradually. Revolver Rani 1st weekend collection has been poor for the movie even after a strong script and acting. Nevertheless, Kangana will surprise us surely for few more days with large earnings.